Right now, our favorite thing about being a Software as a Service company is we can upgrade Tizra Publisher whenever we think it's right, without regard to ship dates or marketing rollouts. 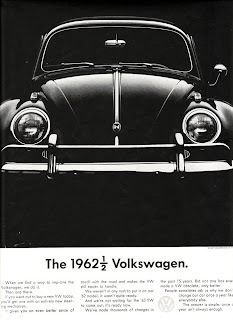 Or as the old Beetle ad said: "When we find a way to improve the Volkswagen, we do it. Then and there." It's been less than a month since we announced instant web signups for Tizra Publisher, but we've already found several ways to improve. So we upgraded our software. Then and there. Tizra Publisher has always let you break documents up into smaller chunks, such as chapters, which can be sold or distributed independently, or remixed into new online products or collections. Now this capability is even more useful because you can let your users download the chunks for offline reading or printing. Each download is watermarked with your site's address, so there's no forgetting where they got it! 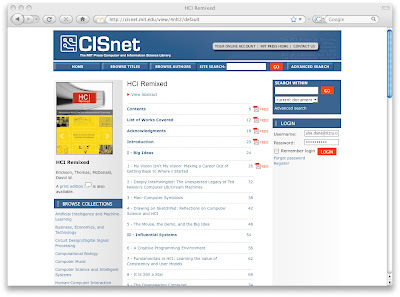 Here's how it looks on the CISnet site MIT Press runs on Tizra Publisher. Note that while in this case, MIT Press is using it to provide free samples, it works just as well for paid or access-controlled content. If you're selling eBooks, you want the world to know what's in your catalog (while of course controlling full-text access), but if you're doing enterprise knowledgement management, or you're a consultant or other professional services firm distributing documents to clients, you have to be more picky. For these applications, we recently added the ability to selectively suppress display of documents in title listings and searches. For example, if you're a law firm sharing documents with a client, no one else will even know those documents exist. To use the feature, you just tag users to put them into groups, then select which groups you want a given document to be visible to. Below you can see the controls set to limit visibility of a document to a group called "Investors." To ToC or not to ToC? 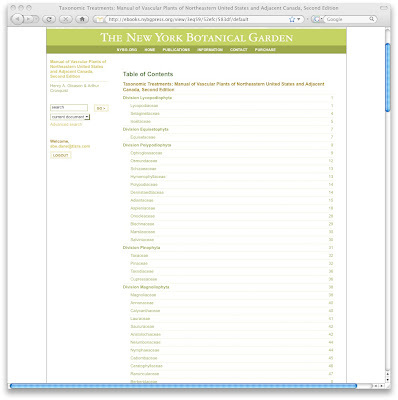 For long documents, like the 910-pager from the New York Botanical Garden Press shown below, Tizra's ability to automatically create web Tables of Contents is a boon...just upload a bookmarked PDF, and bam, you've created an easy browsing experience for your users. But if your document's just a few pages, who needs a ToC? Now you have the choice. Just say No to the Display Table of Contents option, and your users will go straight to page 1 with no unnecessary stops. Many of the organizations we work with already have ecommerce, access-control, or related web capabilities in place, so we've added a straightforward, standards-based REST API, which enables those systems to exchange information with Tizra Publisher to create seamless end user experiences. 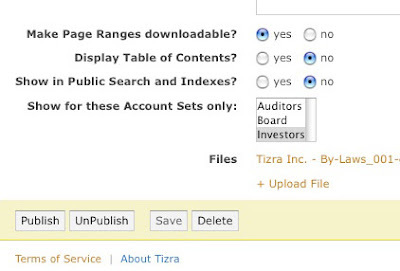 For example, if you already have a database of users, your developers can set things up so those users can access content you host on Tizra Publisher without a separate sign-on. Same holds true if you want to sell Tizra-hosted products via your own shopping cart software. Other new features for power users, include macros that let you selectively display information to users based on their login status, membership in user groups...even what browser software they're using. It boils down to a package of capabilities that's not only very easy to get started with, but like the old Beetle, can take you a long way very economically. TAKE IT FOR A FREE TEST DRIVE NOW!